Team Gotham's Solo, from the very first, doesn't hesitate to let you know exactly what it's all about. Long before you enjoy any gameplay, this petite indie title thrusts the following proclamation at you: 'This game is intended to be an introspective journey about romance relationships.' They're not joking. Solo is an often-bizarre blend of puzzle and philosophy, trope and query. It alternates sporadically between the subtle and the overt, all the while illustrated with a backdrop of bright geometric shapes and strangely unintelligible creatures. Solo is, truly, one-of-a-kind – for better, or for worse. If you don't care to share your personal life with your video games, Solo probably won't be the title for you. This indie demands your honesty with surprising frankness, and immediately goes for the throat with questions like what gender you prefer and whether or not you're currently in a relationship. If you admit you're in a relationship, it'll ask you for their name — and promptly slap the name you give it on the boat that you travel about in. Solo's actual mechanics are easy enough to grasp. 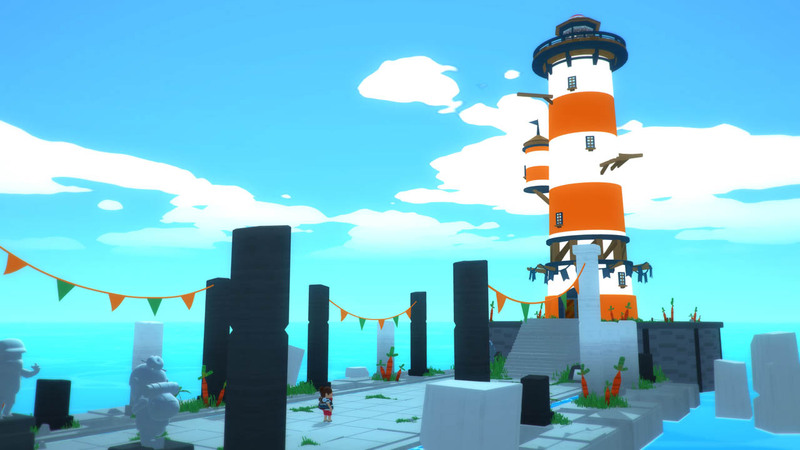 Solve island puzzles to activate lighthouses. Lighthouses activate totems. Totems ask you grand questions about love and give you multiple choice answers. You answer. A new island appears. And throughout your puzzling? You'll be accompanied by a specter that you have opportunities to interact with, and whom often lobs philosophical quandaries at you in response to the answers you give to the totems. There's no story. You're the story. And while that might sound interesting on the surface, the question-and-answer sequences are so heavy-handed that it feels more like you're enduring a lecture about relationships and love from your perpetually-single philosophy professor than actually exploring something deep. Since solving puzzles means you're 'rewarded' with these probing questions about your idea of love, followed up by an unintentional zinger from your spectral friend, players may find themselves hard-pressed to want to keep going. If there was ever a time for puzzling to shine, this would be it. Unfortunately, the puzzles are thoroughly spoiled by awful camera angles and strangely inverted controls that make navigating Solo's world a more nauseous than pleasant experience. The colors and simplistic textures are indeed eye-grabbing at first, but the combinations quickly become overshadowed by the tiresome puzzles and the lack of an actual narrative. Some of Solo's minimalism clearly contributes towards its meditative atmosphere. The music is soft and mellow, and there are no voice lines to cut rudely into your contemplation of the nature of love. There is little to distract you in Solo's world, leaving you to freely focus your attention on the tasks at hand. The only problem? The tasks at hand are not usually defined. Players may find themselves spending far too much time on certain puzzles simply because the characteristics of certain items haven't been explained well enough or at all. Solo desperately wants you to have the introspective experience it claims from the get-go, so it's a little surprising that its puzzles are as halting as they often are. The totems are the end goal and the end reward, offering tidbits of brainfood to chew on, and it may have been more satisfying to have clearer puzzles that didn't stutter progress so much so early on. There's no denying that Solo's fascinating idea of fusing contemplative philosophy into a puzzler is a good one. While Solo may not be the masterful end product of that idea, the same thread could certainly be woven into another Team Gotham tapestry, with far more powerful and stimulating results. Solo shows excellent promise for future titles from this studio that doesn't shy away from making their players think. Solo is a meditative relationship questionnaire under the guise of an aesthetically-simple puzzler. Solo's desire to play the love doctor lends a unique flavor to its otherwise bland and hodgepodge puzzle gameplay, but it's not enough to save it from its painful inability to let its hair down and stay awhile.